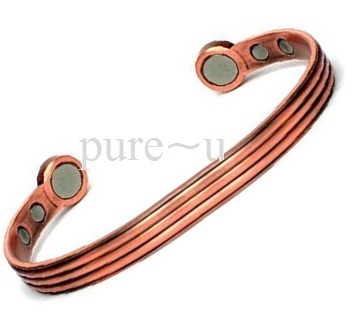 High Power 6 In Solid Copper "Not Plated "
Take advantage at this great price as copper is at an all time high. 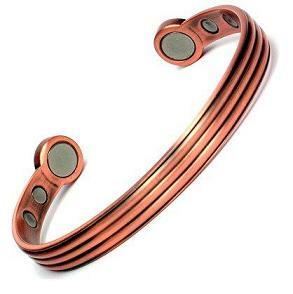 This is a high power magnetic bangle, the main magnet is larger thus giving you a larger magnetic field which is around 3500 gauss the other 4 are each charged around 3000 gauss of power. Neodymium Magnets - North Pole Facing Body - Epoxy Sealed. Approx Sizes X-LARGE -9"- 9.5" LARGE - 8" - 8.5" MEDIUM - 7"-7.5" SMALL - 6"- 6.5"